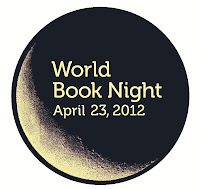 I was just notified that I was chosen to be one of the book givers for World Book Night on April 23, 2012. Along with others across the country, 1 million books will be given away for FREE! How cool is that?? When I applied, I chose from a few juvenile books to give away, as I feel it's important to get kids reading for enjoyment! I don't know which book I will be handing out that day, but I am excited to hand them out -- no matter what book it is. World Book Night has extended the deadline for people who want to apply to be book givers. Head over to their website and submit your application this weekend. The deadline is now February 6, 2012. At their website, you can also learn more about the organization and check out the books that will be given away. I think this will be a ton of fun! Why don't you consider joining the fun?